Governments of the United States, Australia, Canada, and the UK explained to children in free civics lessons. The study guide and map offer an overview of the basic architecture of democracy, give historical background information, and provide a framework for comparing the state of political rights and civil liberties in different countries around the world. Upper high school level. A nation simulation game. You create your own country, fashioned after your own political ideals, and care for its people. Either that or you deliberately torture them. It’s really up to you. These unit study supplements include quick timelines for each president, fun and interesting facts to help students retain information better and activities such as crossword puzzles, spelling games and biography organizer to test their knowledge after studying each president. Start learning now! Site full of resources for students studying the 2016 US Presidential race from Student News Daily. Designed for kids of all ages. Just click on your grade level. A section for parents and teachers, too. Using appealing, full-color illustrations, and engaging activities, this site will extend your learning in the basics about the American federal government. Jim Chen, a law professor at the University of Minnesota, developed a little item that involves reading the Constitution for clues to a scavenger hunt. It requires no training in law at all. It is advanced, but there is an answer key. 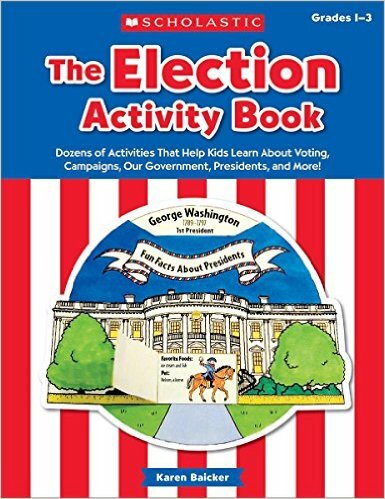 The Election Activity Book (2016): Dozens of Activities That Help Kids Learn About Voting, Campaigns, Our Government, Presidents, and More! Help students understand the election process (and get involved!) with these quick, easy, and engaging activities that teach about how we elect our leaders; the presidency; the rights and responsibilities of voting; the differences between local, state, and national government; and more. Includes a read-and-write mini-book, an election timeline, polling and graphing activities, and literature and web links. Revised and updated for 2016! Games to help you understand the words bandied about during election campaigns. We present both the popular and electoral votes in each election, as well as states won, issues in the election and turnout. We also provide a complete review of the 2004 election. Select a topic or keyword and find what the Constitution has to say about it. What is government and what role does it play in our lives? Why do we need government? Pretend to be President for a day. From PBS. Learn how laws are made and how congressional history has influenced today’s U.S. Government. Play some fun games. Do you like unit studies? Join with your homeschool friends and their parents in this mock election. Get actively involved in a full-fledged campaign and national election. Knowledge is power. Make it work for you! Inside the President’s House. Facts and fun for all ages. Learn about past presidents and their pets, and much more. Take the Quiz now and find out where you fit on the political map. Short. Just 10 questions. Information and ideas for young people who are studying about the Australian parliament without the help of adults. The Government of Canada is pleased to provide access to a new resource guide to assist anyone in learning more about our system of government and its institutions. In French and English. Canada is in its 42nd Parliament. The Government has been formed by the Liberal Party of Canada, with their leader Justin Trudeau serving as Prime Minister. Justin Trudeau commands a Majority Government. This website was created over two years (2008-2010) as part of a Hamilton Wentworth District School Board initiative to revamp its CHV2O program (CHV2O) and is updated regularily. If every MP turned up at the House of Commons Chamber at once, there would not be enough seats for all of them to sit down. Learn this and more about the British government system.